In our Inbound Marketing Blueprint, we focus on strategy and process, not on technology, but to get the job done right, you need the right tools. We recommend the following general toolkit for inbound marketing, keeping in mind that the playing field is constantly changing. HubSpot is the recognized software leader in inbound marketing. The HubSpot platform integrates website hosting, content management, blogging, search engine optimization, social media promotion and engagement, lead capture and conversion, and analytics. For more details, please contact us for a free demonstration. The most widely used blogging platform is WordPress. WordPress has a free version, but a premium version should be used in order to associate your blog with your brand’s Internet domain. We recommend the HubSpot platform since it integrates blogging, SEO and social media promotion under one common architecture. During the last 10 years most search engine optimization has been done by SEO consultants or companies specializing in SEO services. Much of the keyword research and analysis has either been carried out using proprietary applications, with the exception of the publicly available Google Analytics and Google Adwords tools. With the advent of inbound marketing, SEO has become an integrated part of the process, and there are new tools available for combining website and blog copywriting with SEO. We recommend the HubSpot platform since it integrates blogging, SEO and social media promotion in one place and enables your team to incorporate SEO directly into your content marketing activities rather than relying on outside SEO consultants. There are also some excellent SEO tools available from SEOmoz and Raven Tools. You will need personal accounts for Twitter, Facebook and LinkedIn for each person on your team who will participate in social media. In addition, you will need at least one Facebook (Fan) Page for your company or brand and at least one official company persona account in Twitter. Many companies set up a Company account in LinkedIn and/or a LinkedIn Group focused on a region or industry (or both). You may also want to create a custom social media community site specifically for your brand. At the relatively low end of the cost spectrum for custom communities is Ning and KickApps, while more powerful customized community solutions can be found at Powered. 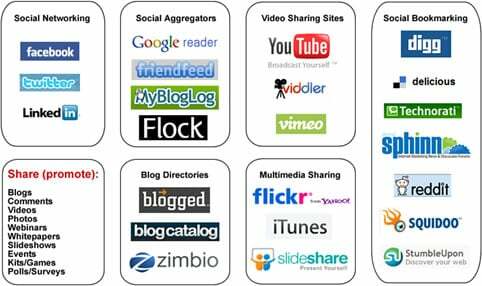 The following chart shows a sampling of the main social media and social bookmarking sites for which you will need accounts to promote blogs and build your brand awareness and reputation. We recommend setting up at least one account for each site or tool. Social media engagement on a daily basis can be extremely time consuming, and in many cases, your staff will be responsible for multiple roles. Fortunately there are several solutions promoting and engaging in multiple social media accounts without having to duplicate effort. Seesmic, Tweetdeck and HootSuite are the best known applications for managing social engagements, but there are many others. There are several free software solutions for monitoring your brand in social media, including Trackur, Postrank Analytics, Google Alerts, Social Mention and TechrigySM2. There are many good for-fee solutions that offer a more robust assortment of analytics and reports including Radian6, Scout Labs, Sysomos and more. We recommend trying these tools out to see which solution is a best fit for your company. Customer relationship management (CRM) solutions have been available for many years, but only recently have they become tied to social media and inbound marketing. While traditional CRM seeks to integrate and automate the sales and customer service cycles, Social CRM includes the conversations between customers and your staff via social media and the leads captured via inbound marketing. We recommend the HubSpot platform integrated with Salesforce.com since this solution is an ideal way to capture and track leads, automate sales processes and smoothly transition to customer service and support. This post is an excerpt from our report. Download the entire report here.